WOMEX 15 - Thank you, everybody. Köszönöm! The 21st edition of WOMEX has come to a close with a great Award Ceremony, honouring Glitterbeat Records, Ramin Sadighi and Cheikh Lô! WOMEX drew over 2,500 delegates from 90 countries and we've had five amazing days of Trade Fair, Networking, Conferences, Films and Showcases, and we'd like to thank the people that make everything possible - you, the WOMEXicans, our beloved delegates! On behalf of the entire WOMEX team we would like to thank you for making a wonderful WOMEX 15 in Budapest, Hungary reality. Our 21st edition was the first edition in Central Eastern Europe and it was very well received both internationally and in the region. We continued building bridges over cultural divides, including many new friends from the regional music scenes. Together with them we made a positive impact as you all can see in the media already and as we hear from our local partners, Hangvetö, whom we had the greatest honour to work with. Köszönöm! 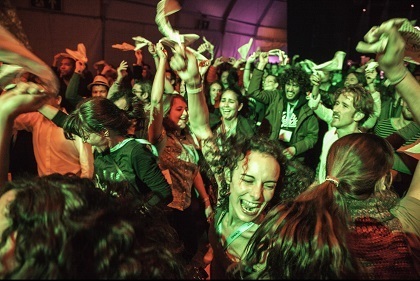 The impact of WOMEX 15 even was recognised by UNESCO under its Convention on Diversity of Cultural Expressions. As WOMEX Director Alex Walter put it in our round-up press release: - when UNESCO recognises WOMEX they recognise the efforts of all of you, dearest WOMEXicans, endeavouring to make this world more open and colourful with your everyday work. We are proud to belong to this group of cultural activists and we are proud to have done this edition in Budapest together with you. It is our firm belief that it has already strengthened the local music scene and solidified connections to the international scene – as a worldwide community, we will continue to build bridges like we did here. We can't wait to welcome you to WOMEX again in 2016 for our 22nd edition in Santiago de Compostela, Galicia, Spain from 19-23 October 2016.